Lost Girl, Cassidy Jackson-Carroll, shares her experience running her first triathlon while in Belize. Having arrived in Belize to teach Physical Education for a year, the first question many people asked me was if I was going to compete in the Belize Lionman Triathlon in five weeks time! Sports have always kept me involved, in one way or another. However, I had never completed a triathlon. Triathlons simply fascinated me – ‘how can 1 person be so good at 3 different sports?’ I had often thought, ‘I’d love to do a triathlon one day, but…’ It was the ‘but’ holding me back for many years. It was also the not knowing how to get involved. I finally bit the bullet and decided I would do the triathlon, I just had to train, (in only 5 weeks) find a pool, find a bike, and put those training sessions together with some running. The swimming training was under control, I simply had to arrive at the pool when only the groundsman was there, (i.e. early), pretend I had membership at the club, and push out my laps in the 20m pool (1 of the longest in Belize, there are no Olympic size pools in Belize!). Cycling was the next obstacle. Belize’s gravel highway has a lot of potholes! And if the potholes didn’t have you swerving across the highway, the smashed up crabs (loads of crab kill in Belize, as it is 6mm below sea level), stray dogs, and broken glass will! Throw in a few speed bumps and roundabouts, and cycling in Belize can be quite the adventure. I often found on my return journey with cycling, I’d hit a wall – of WIND! There were also cars careering down the highway at ridiculous speeds, treating the two-lane highway as a bowling alley – and I was the pin! Some of the drivers would be coming at me two abreast, because they were trying to overtake the vehicle in front of them. I told my friend of my afternoon highway cycle and she was aghast. “No one goes cycling at that time!” (It was the busiest time of the day to be on the highway. I must admit, I didn’t see any other cyclists, like I normally did on cycling trips.) Needless to say, that was my last afternoon cycling session! Training for the running-leg didn’t happen as much as it should of. 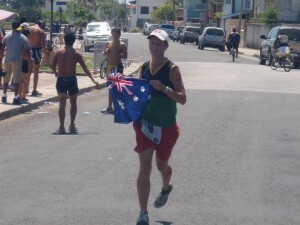 If I did go for a run, it was often in the morning, because Belize’s weather is HOT! Five minutes of running at 6am had you sweating like you’d just been sunbaking in a furnace! I just had to have confidence in myself that I could make the 10km on the day! Sunday arrived. The swim leg had been set up in the Caribbean sea, and for the past week, flagged sticks marked the 750m course (we swam it twice). I had trained on the bike and run course previously – no hills. Lack of hills always makes an athlete pleased! Due to such a small field, eight of which were Guatemalans, setting up in the transition area was easy. Socks in my shoes – I was wearing trainers for both the cycle and the ride. I had been training on a friend’s bike, a mountain racer. Naturally all those on professional cycling bikes (EVERYONE else), would have an advantage over me, but it didn’t really phase me – I was here to finish the event and try to not come last! With the blow of a whistle, carnage ensued. In all honesty, 30 bodies scrambling to find a comfortable swimming position was not the circus scernario I anticipated. However, my navigational skills needed a GPS – I was all over the course. In the first lap I swam off course about 3 times! The first 300 meters had me short of breath, and I realized this was probably because I had just gone out too fast – I needed to slow down, otherwise I would find myself hanging onto one of the wooden sticks, waiting for rescue! I’d completed the first lap and there were people in front of me and people behind, so I was doing something right. I found the second lap a lot easier than the first and even overtook three people in the last 50-100 meters. Scrambling out of the sea, I felt great! As I ran into transition someone cheered me on, saying, “you’re the second female out, the other one just left on her bike!” Naturally I assumed she meant the defending champion, but as I looked at the bike rack and her bike was still hanging there! The other female competitor must have swum a very fast race! 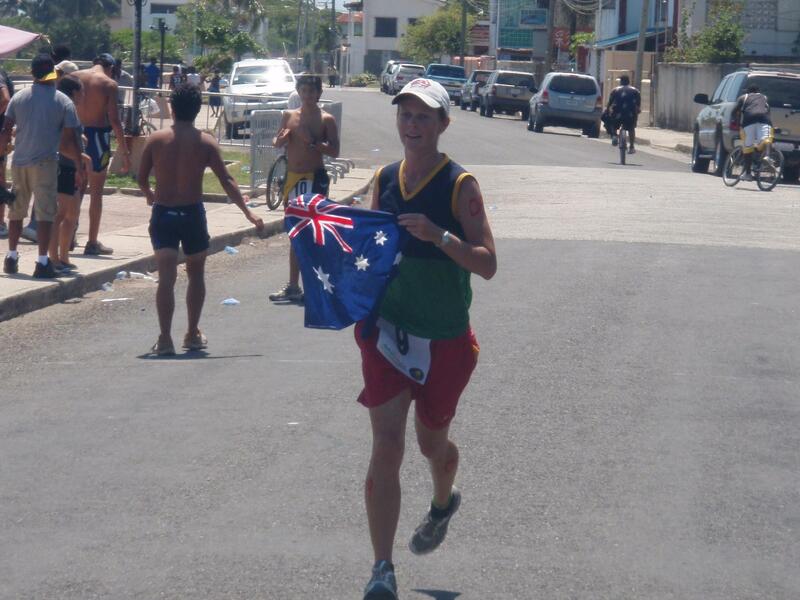 Transitioning was a little slow, as I climbed into some shorts and a high school running singlet (over 10 years old!). Cycling along, I was rather smitten with myself – here I was a third of the way through my first triathlon, and I’d faired well in the swimming! At about 2km the defending female champion overtook me, leaving me for dust – that was bound to happen at some stage – still I had swum faster, and that made me proud. Passing through the 2nd roundabout, I heard a scrapping noise and felt something that I had felt about week and a half before and I didn’t like it. I looked down at my rear tire and thought, “It can’t be! Surely not!” I jumped off my bike on the side of the highway – a FLAT TIRE! No way, this was not part of the plan. I know these things happen, but not in my first triathlon! This tire had already been flat, once. I called out to the traffic warden if he could radio back to the official at the start. He was no help, just shrugging his shoulders, as if he didn’t understand English. (English is the national language of Belize). I started to push my bike along – I didn’t know what to do. An official came by on his motorbike. I flagged him down and alerted him to my dilemma. He radioed back to the start and then told me there was nothing he could do – I would have to keep riding the bike! “That’s ridiculous!” I claimed. I know you are meant to have spare tires and equipment for triathlons and a support team catering to your every need if so required – but c’mon, this was my first triathlon, I just wanted to give it a go. Here I was, a damsel in distress on the side of a Belizean highway with a battered bike and now a battered spirit. Tears were welling under my sunglasses. ‘Damn it, I am FINISHING this triathlon!” I told myself. I limped my bike into the gas station and asked if he could put any air in the tire. That’s when we found my old nemesis – glass! Unless I had a tube, he couldn’t help. Then I flagged down a policeman – and asked if I left my bike at the gas station, could he drive me back to the start. I grabbed my water bottles and jumped on. I thought the circus show would be in the swim leg, however I had just created my own show (I do like to keep things interesting, and the crowd entertained!). Blazing back into the transition area – people just starred at me – my friend came running through the crowd. “Absolutely!” She saw a random guy in the crowd, asked him if he was doing the triathlon, he wasn’t. Before he even knew what was happening, my friend had pushed me off on his bike – which was similar to the mountain bike I had previously ridden. “GO! GO!” people were yelling now. I just started cycling. By the time I was on my second lap for cycling, some people were already half way through the run! I was a little annoyed that so much time had been wasted and that I had to ride an extra distance due to the flat tire. But I reminded myself, I had entered to finish the Triathlon – Oh, and maybe not finish last – ironically enough, I was now dead last in the race!! Finishing off the last 3km of the bike ride, it seemed like everyone else was already running! Another cyclist had just returned before me, he was still tying his shoe laces, as I hobbled out of the transition area. I tried running, but felt like a penguin that had just dismounted a horse! Why was I wobbling around like bowlegged cowboy penguin!? I didn’t have pain searing along my calf muscles, like others complain of, but I wasn’t exactly stable either! I steadied myself and fast paced walked for a bit. 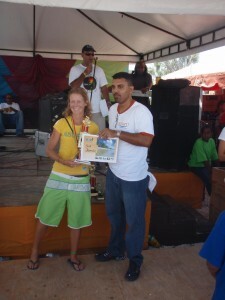 As a typical Belizean day, the heat was burning, and the water stations were too far apart. Although I drank a lot of water, I poured more over myself, being bone dry again within a minute, and perspiring again within 10 seconds! Ironically, as I crossed the finish line on my first lap, the defending champion had claimed female first place! I was 5-6km behind her, which considering my earlier circus show, I thought wasn’t too bad an effort! “But you might walk from here!” she said. I couldn’t have been prouder – I had completed my first Olympic distance Triathlon, admist punctured tires, tears and heat – as well as receiving a medal, trophy and cash prize money for my efforts. 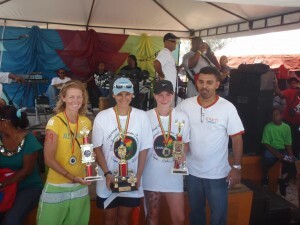 And I hadn’t come last – 3rd last and 3rd female finisher! I am still unaware of my time – Belize Triathlon association was not the most organized, although I’m guessing it was about 3hr 30-40minutes. 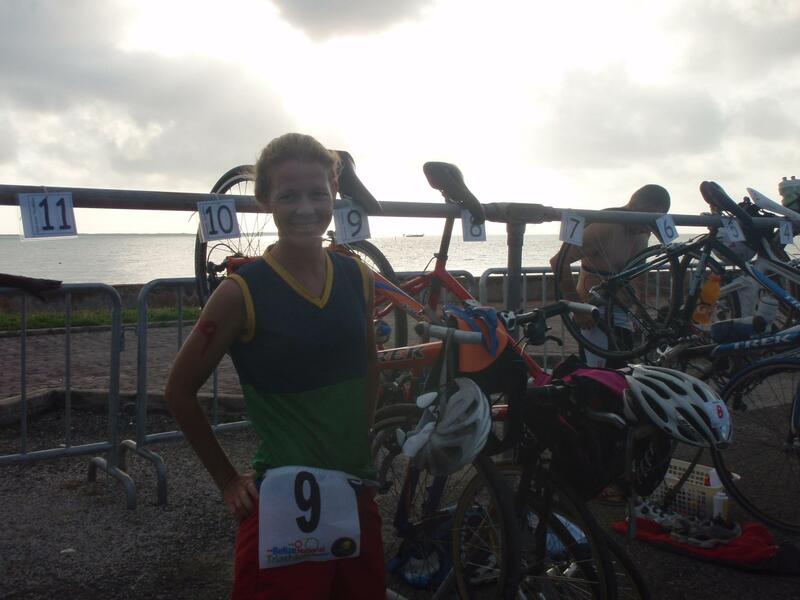 Although unorganized, the Belize Triathlon allowed me to jump on the back of a motorbike, steal someone’s bike and take a ride in truck – all of which would have probably found me disqualified at any other triathlon! A small competing contingent in a small country, I had achieved a massive feat. The days following, I was sore-less (no muscle, or mental fatigue,) and psyched to compete in another triathlon – once I learn how to fix punctures! The only way I knew I couldn’t do a triathlon, was by simply doing one! good on ya girl .. what an effort and you didnt come last..